As there are increased calls for more bikeways, we try to look at some good examples of what I’d call “practicable” road sharing. I term it “practicable” because it is something doable or is already being done or practiced. I tried to find a few good examples of practicable road sharing to show that it can be done and usually if all road users respect each others’ right to use the road. This respect can be developed over time and requires some familiarity for each users behaviors. Of course, there will always be abusive or disrespectful people on the road including drivers of different types of vehicles. Reckless or unsafe driving is not limited to public transport or truck drivers. There are also many unruly private vehicle drivers who endanger the lives of others whenever they are on the road. Then there are the motorcyclists, cyclists and pedestrians – all road users and also with bad apples or “pasaway” among them. 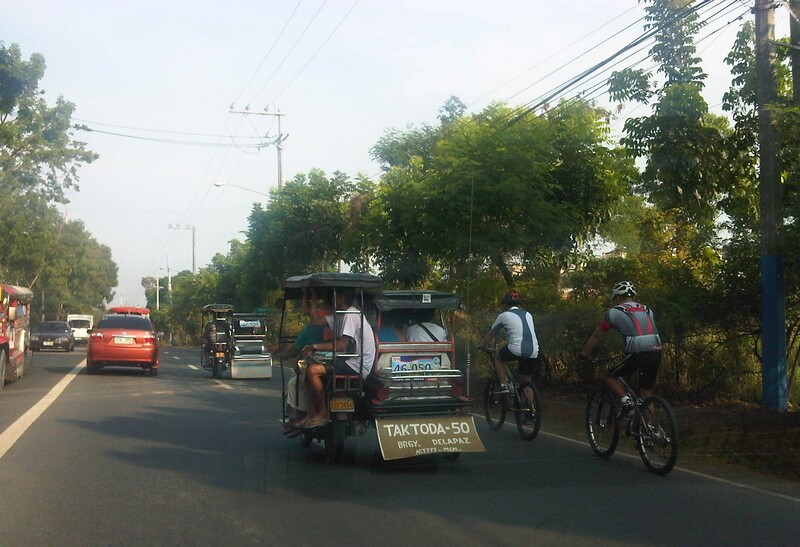 Road sharing happens everyday in Antipolo City in the Province of Rizal. Along Ortigas Avenue and Sumulong Highway – the two main routes to and from Antipolo, you will see motor vehicles, bicycles and pedestrians sharing what are mostly 4 lane, undivided sections of the two major roads. Antipolo is a very popular destination for cyclists so even during weekdays you will find a lot of people cycling up and down the mountain roads even during the night time and very early mornings. While many are recreational riders, many, too, are doing this for health. I would bet that a good percentage might be biking to work or school but there are no hard statistics to show this (topic for research?). 1. Slow moving trucks or jeepneys hogging two lanes and not giving way to other vehicles to pass them. 2. Jeepneys and private vehicles racing up or down the mountain roads and overtaking even in perilous sections (i.e., those already identified as prone to crashes). 3. Tricycles taking up the middle lanes and maneuvering anywhere. 4. Cyclists taking up the middle lanes or sometimes the entire two lanes of any direction preventing other road users to pass them. 5. People crossing anywhere along the road especially at blind sections (curves) where sight distance is limited. There are practically no pedestrian sidewalks along most of Ortigas Extension and Sumulong Highway so pedestrians would have use the carriageway. As there are a significant number of people walking (e.g., students, workers, and even joggers or walkers), motorists and cyclists need to be careful not to hit these people. The same people, however, need to be aware of these vehicles and should exercise caution, always being alert as they use the road properly. Ultimately though, I would like to see walkways built along Ortigas and Sumulong especially since there is already an increasing demand for walking especially during the summer months when Antipolo holds its fiesta and a lot of people go on pilgrimages on foot to the Shrine of Our Lady of Peace and Good Voyage. There is practicable road sharing in Antipolo because most road users are already familiar with each others’ behavior and accept each others’ presence and rights on the road. These road users are likely residents of Antipolo or nearby towns or regular visitors to the city. They are “nagbibigayan sa daan.” The “pasaway” people are likely the newer ones who seem to think that the way they drive or ride (i.e., unsafe) elsewhere is the norm. Of course, that goes without saying that familiarity with the roads and its users also breed risk takers who think they already know the road and have the skill and experience to drive like crazy. Here is where effective enforcement (e.g., timely apprehensions and reminders) and engineering (e.g., traffic signs and pavement markings) comes in to address the gaps in safety in order to reduce if not totally eliminate crash incidence along these roads. By d0ctrine in Behavior, Cycling, EST, Mode Share, Motorcycles, NMT, Pedestrian, Policy, Public Transport, Road Safety, Traffic flow, Walking on August 9, 2014 .